who here is ready for an auction? do Ihear 0.8 or more? do I hear a massive 1? do I hear 2.1 or higher? do I hear 2.5 ? do i hear 1.98 xcp? Can i also auction my cards? Theo is the most unfriendly person ive ever meet on pepe cash…. get on the zcash train! @theogoodman is it still possible to add items to the auction? do I hear 1.4 or more? How many in the lot? any pictures with bobby lee holding it? ALL POLICIAL POWER COMES OUTOF A RAREPEPE! How many lots were sold? Will you get in touch throgh pm? I hope the winner enjoys the quite-a-few pepes I donated for the cause. They will be well cared for. Bummed I missed out most of the auction. 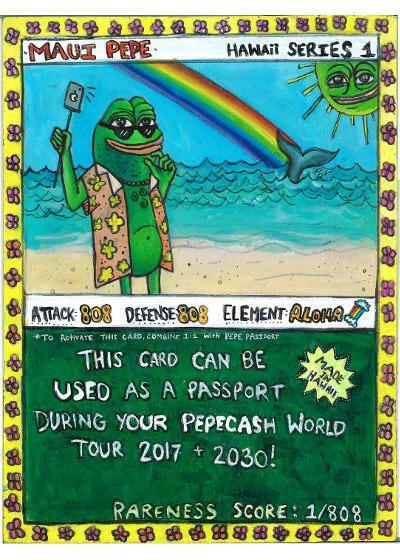 Don’t forget to pick up a PEPECENT on the DEX tonight, they’re DEADLY!!!! Who is going to match it? this was me pussies, donate! Nice auction. Shame I missed it.